This month I have a novelette being published in German, my second story in German and my longest translated story to date. 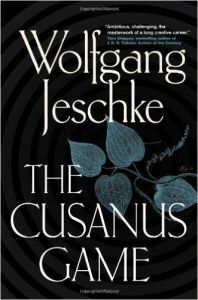 This piqued my interest in German Science Fiction, so I took the opportunity to get hold of Wolfgang Jeschke’s award-winning 2005 novel Die Cusanus Spiel. My German isn’t good enough to read the novel so, in fact, I got the 2013 English version, The Cusanus Game, translated by Ross Benjamin.